Permanent life insurance policies – those with cash value – are a source to consider if you need access to cash. Life insurance companies allow you to borrow against your permanent life insurance policy, using your cash value and death benefit as collateral. Interest rates may be lower than for other types of loans, and in some situations you may chose not to repay your loan. This article explains the advantages and disadvantages of life insurance loans. Do You Have the Right Kind of Life Insurance Policy to Be Eligible for a Life Insurance Loan? Term life insurance is like renting a house – you don’t build up any equity (cash value) you can borrow. Only life insurance policies that build up cash value can be borrowed against. And some cash value (permanent) policies are designed better, when it comes to taking a life insurance policy loan. Dividend-paying whole life insurance policies are ideal for borrowing purposes, as we’ll explain in this article. What Are the Advantages of Life Insurance Policy Loans? It is easy to apply for a life insurance loan. No formal application form is required, and there are no fees to be paid. Just let the insurance company know how much you need, and where they should send the money. Assuming you have sufficient cash value, you’ll have the money in just a few days. And while your life insurance loan is outstanding, your cash value can continue to grow – just as if you never touched the money – if your policy is from one of the handful of companies that offer such policies. If you borrow against your home, you’ll go through an extensive application and underwriting process, and you’ll typically have to pay fees, which may include an appraisal fee, closing fees, even points. You can rack up charges on your credit cards, but the interest rate – usually compounded daily – isn’t cheap. Cash advances usually carry an even higher rate, and there’s often an up-front fee, as well. You can get money right away by pawning things you own, such as jewelry, musical instruments, photography equipment, and firearms, but there are significant disadvantages. You’re typically able to borrow no more than a few hundred dollars, and you’ll rarely get more than 60% of the item’s resale value. The interest rate you’ll be charged is often exorbitant – as much as 100% per year (although your loan will typically be due in a few months). In fact, technically, you’re not even required to repay a life insurance loan. Make no mistake: it’s not free money. When you die with an unpaid life insurance loan, the loan balance and outstanding interest will be deducted from the death benefit paid to your beneficiaries. Life insurance loans taken to fund retirement income are typically not repaid. Work with an experienced life insurance advisor who can help monitor your policy to make sure it stays in force while you take out money for retirement. Another common source of cash is a 401(k) loan. Our article comparing 401(k) loans to life insurance policy loans explains the pros and cons of each. Are There Tax Consequences for Taking out a Life Insurance Loan? What Are the Disadvantages of Borrowing from Your Life Insurance Policy? If you allow unpaid interest to accumulate to the point where the interest plus your outstanding loan balance equals or exceeds your policy’s cash value, your policy will lapse. In that case, the IRS would consider the policy loan as having been “forgiven,” and the amount forgiven would be subject to income tax as ordinary income. Some life insurance companies pay you dividends at a different rate if you have borrowed against your policy. Only those companies offering non-direct recognition life insurance policies will credit you the same dividends, whether or not you have a life insurance policy loan in effect. How about Borrowing from a Universal Life or Indexed Universal Life Insurance Policy? Agents trying to sell you a universal life policy or an indexed universal life policy like to tout a loan feature available in some policies that might allow you to make money by taking a policy loan. For example, the illustration may show a 6% loan interest rate, and an 8% annual return. That sounds pretty good. Just get yourself one of those policies, borrow every dime you can at 6%, and earn 8% on the same money! In most universal life and indexed universal life policies, every year there’s no gain in the stock market index, there’s little or no credit to your policy. Meanwhile, the costs are continuing to be taken out. And now you have a recipe for disaster. Your costs are going up faster than you expected, and meanwhile, you must keep making loan payments to keep your policy from lapsing. When you learn how Bank On Yourself-type whole life insurance policy loans work, you’ll discover that Bank On Yourself policy loans have none of these downsides. If you have a variable universal life policy and you’re using funds in your investment account for collateral, the company may move those funds to a guaranteed fund for the duration of your loan. Your earnings on the moved funds would be based only on the guaranteed rate. Can You Afford to Pay Back Your Life Insurance Policy Loan with Interest? It’s important to realize that like just about every other loan you can think of (except maybe one from your mother), you’ll be charged interest for a life insurance policy loan, and that interest must be paid. If you don’t pay the interest as part of the repayment plan your advisor can help you create, the interest will be tacked on to your loan balance. Over many years, that interest can become a sizeable amount. If you don’t repay your life insurance loan (except when loans are taken to fund retirement income), you’re robbing yourself, because you’re stealing (from yourself) an asset that could provide future security for your family and funds for your beneficiaries after you’re gone – not to mention, you’re depleting an asset you could have used as collateral for future loans. And in a dividend-paying whole life insurance policy, life insurance loan interest you pay ultimately benefits you, the policy owner. At the end of each year, the company calculates their income from all sources, including the loan interest you and others paid, and they calculate the company’s expenses and the death claims they paid out. If that yields better results than the worst-case scenario they projected, they pay a dividend to all the policy owners. So you end up getting the benefit of the interest you pay through a combination of guaranteed annual increases plus any dividends the company pays. That means that with a properly structured Bank On Yourself-type life insurance policy, both the principal and interest you pay can ultimately end up in your policy’s cash value. What if You Can’t Repay Your Life Insurance Policy Loan? If what you owe (loan balance plus unpaid interest) equals or exceeds your cash value and you do nothing about it, the insurance company will use your cash value to pay off the loan. This will cause the policy to lapse, causing you a taxable event that may be quite significant. That means that come April 15, you will owe income tax on the $125,000, at whatever tax rate you find yourself in for your total income (including the $125,000) that year. How Can You Get All the Advantages of a Life Insurance Policy Loan and Avoid All the Disadvantages? To summarize the key points made here, realize that a loan is not free money. It is an amount that must be repaid either by you, during your lifetime, or from the death benefit your beneficiaries would otherwise receive at your death. Be a responsible borrower. Do not borrow frivolously. At least for your first few loans, discuss your plans with your life insurance advisor. Set up a payment schedule that includes repaying the loan and the interest. As we’ve pointed out, this can be on your terms, over a period that seems appropriate to you. Do not count on the dividends of your policy to make your payments. Dividend payments are never guaranteed. At the same time, use a life insurance company with a consistent track record of paying dividends every year – even for more than a century. These companies do exist. Work with your life insurance advisor to monitor your loan status and your policy balances regularly. If you foresee trouble, discuss how you can use the flexibility built into a properly-designed policy to avoid the trouble. Use a life insurance company that offers non-direct recognition policies, meaning you’ll receive the same dividends whether you have a loan outstanding or not. There are so many advantages to using the loan privileges of a properly-designed dividend-paying whole life insurance policy. Bank On Yourself-type dividend-paying whole life insurance policies are specifically designed for maximum loan availability. 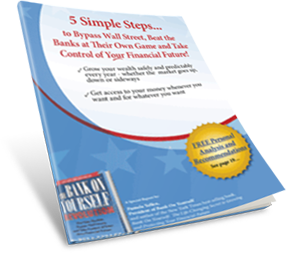 Find out more in our free special report, 5 Simple Steps to Bypass Wall Street, Beat the Banks at Their Own Game and Take Control of Your Financial Future. Then let a specially-trained Bank On Yourself Authorized Advisor show you what a Bank On Yourself-type policy could do for you and your family. Get a free Personalized Solution based on your situation, and a referral to a Bank On Yourself Authorized Advisor who serves your area.